It wasn’t until moving to Europe that I really got the urge to visit Spain. It wasn’t that I didn’t see the amazing qualities that Spain possessed – sun, sand, surf, sangria – but that other areas of Europe seemed to have more appeal. However, the longer we are in Europe, the more attractive the beach and warm locations have become. Two years in and I panicked. We hadn’t visited Spain yet! Barcelona has been on the bucket list from the beginning, but it had always seemed difficult to organize, like many of those now left on the list. Ryan Air, our transport mode of choice despite its reputation, doesn’t fly directly into Barcelona. The two options were Reus and Girona. We chose Girona on the Costa Brava due to the flight times and regularity. As it turns out, it wasn’t difficult to get into the city. There is a bus that lines up with the flight times at Girona. It does take about an hour and a half, but it was only 25 euros each, return. Our tickets cost $75 return on Ryan Air, so even with the bus ticket added on it was still much cheaper than the main airlines that fly into Barcelona El-Prat airport. It always pays to do your research though, and I am sure that when Vueling and Lufthansa have sales that the fare can be competitive, particularly since bags are included with non-budget airlines and you can get into the city center with the underground from El-Prat. We both took a day off work and headed away on Friday, April 24. I forgot to pre-book our parking at Frankfurt Hahn this time around, which was a mistake. P3 was full, so we ended up having to park in P2 and at the normal rate. My biggest piece of advice is to always pre-book your parking. Yes, people will say you can just drive straight up and yes, people will say that there is a booking fee – but do the math! Pre-booking at Hahn is always significantly cheaper – just bear in mind that you have to book more than two days in advance. Our flight left Frankfurt Hahn at around 0900 and we arrived at Girona just after 1100. It was nice being able to have a sleep in compared to the usual 0600 and 0700 flights from Hahn! The weather was pleasant when we arrived. The bus drops you at the main bus station in Barcelona. We bought a data day pass for T-Mobile for 2,99 euros and decided to walk to our hotel with a stop for lunch along the way. 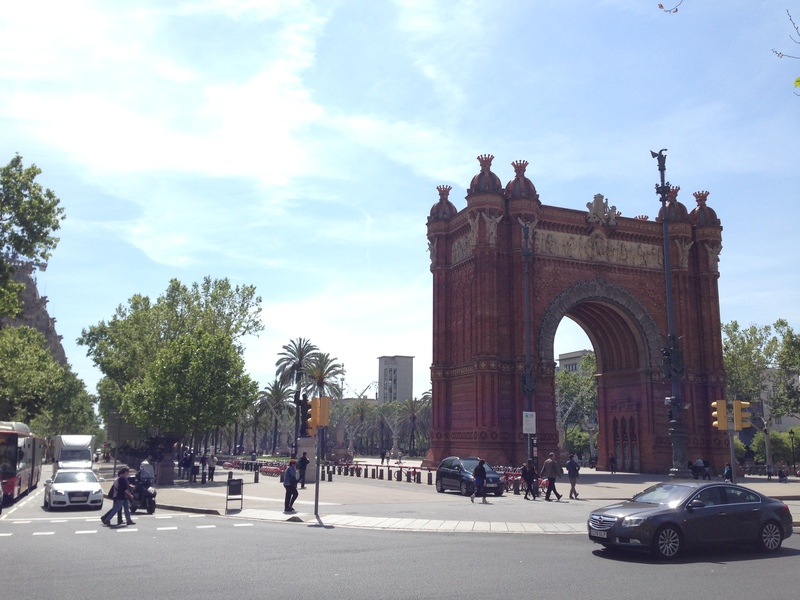 We passed the Arc de Triomf almost immediately, which had an awesome park behind it. I mentioned to Nick how cool it would be to have markets along there. We sat and enjoyed the atmosphere and then continued walking. We eventually made our way to a plaza area and sat outside for lunch. One thing I will never get used to are the beggars. We were sitting there trying to enjoy our lunch and got approached by two separate beggars. The restaurants let them do it. While I feel for them, it’s not hard to tell when someone is begging just to get their next hit. That was the only time we experienced beggars during the trip though, so we can’t complain about that too much. After lunch we wandered through the Gotic area and eventually made it to our hotel. We stayed at the Hesperia Barri Gotic hotel. I booked it through hotels.com and was able to use a free night that we had gained through all of our stays. Hotels.com gives you one free night after nine paid for nights on their website. Again, it pays to shop around. Often booking.com is cheaper for the same hotel, so it did take awhile to get to our ten. Also, don’t forget to book through ebates.com as you end up getting a percentage back in cash for all your stays on most hotel websites. I hate when I forget because it’s always awesome to receive a cheque in the post a couple of months after you travel with some money back which can go towards the next trip! I sound like I’m advertising here, but I’m not. These are just tips I’ve picked up along the way and want everyone else to get the benefit of. Our hotel had recently been remodeled and it seems to have joined the NH hotel chain. It was comfortable, clean and in a great location. I would absolutely recommend it as it was walking distance to Barceloneta (the beach area) but also to the tourist areas (Gotic Quarter and Les Rambles). After we checked in, we made our way to the beach area. It was about a ten minute walk and we passed lots of interesting sights along the way. Given its proximity to Africa, it wasn’t surprising that there were a lot of Africans peddling their goods for sale. It was amazing to see them whip up their sunglasses off the ground when the police came along – who knew they were all attached to the sheet! There was a band playing Latin music which was great to listen to. There’s a very ‘cool’ vibe in Barcelona – almost hippy like and it was really unexpected. We wandered further down to the beach and found a place to enjoy a carafe of Sangria. It was absolutely delicious and extremely alcoholic. It was time for a quick nap before we headed out for our evening adventure. I had researched in depth all of the tapas tours offered in Barcelona. There were a range of them – some from 40 euros, all the way up to 140 euros each. I had heard that tapas could end up being an expensive dinner, so I wanted to go with a tour where I feel like you get to learn and eat at the same time, which is more valuable to me. In most major western European cities, Sandemans is a free tour company. We did one in Prague. Sandemans in Barcelona offered a tapas tour. The website said it was 16 euros and included some tapas at one restaurant, one alcoholic drink and discounted tapas rates. I thought that was perfect as that way I could choose my tapas. I was worried about having to reject lots of tapas as I can’t eat pork or shellfish. The tour started at 1800 and we were hungry. We had about 20 people in our group from all over the world. Nick and I immediately connected with two lots of couples. James and his wife were from South Africa and Stephanie and her husband lived in Scotland – but Stephanie was James’ cousin. They had kids our age but they were a blast to hang out with. Of course there was lots of banter about rugby teams and the world cup this year! Our first stop was to a tapas place that we got a free drink at if we bought at least one tapas each. 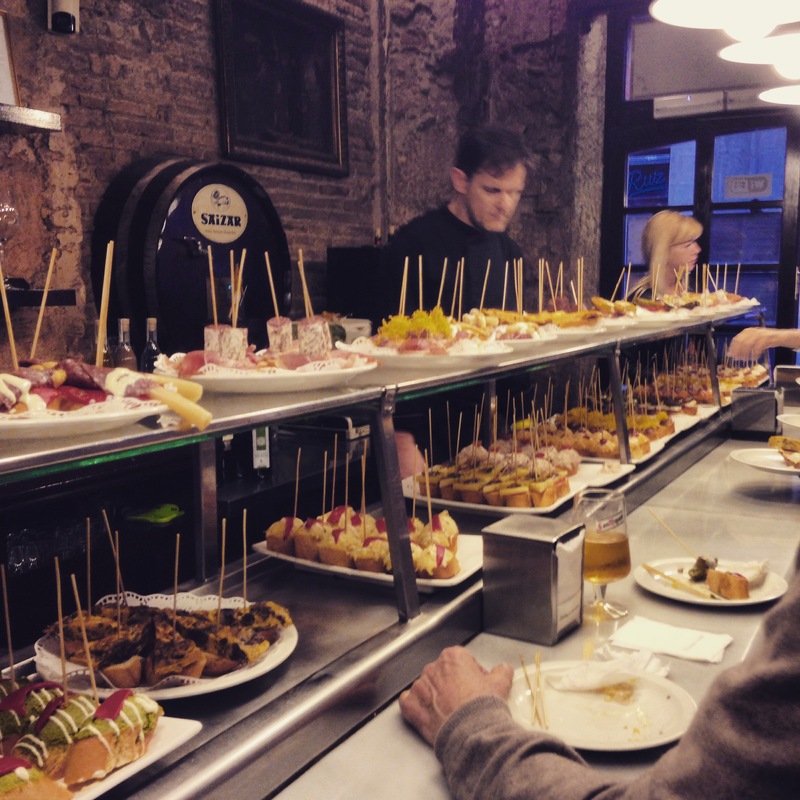 The tapas were discounted to 1,50 euro each – so do the math! You could get a drink and a tapas for 1,50 euro. I got two vegetarian tapas and Nick got four. They were delicious and a great start to the night! At the second tapas place, it ended up being almost a full meal. I had said I was vegetarian so I ended up having a different menu, but it was great. The first course was a type of potato croquette with sauce, the second was asparagus with a balsamic glaze… and then my memory gets hazy. The sangria in the afternoon combined with the tapas drinks and sunburn has absolutely affected what I remember from the night. The four courses came with another free alcoholic beverage. I do remember all of the food being amazing at that place, and it was near the beach in Barceloneta. I recommend doing the tour just to go to that one place. 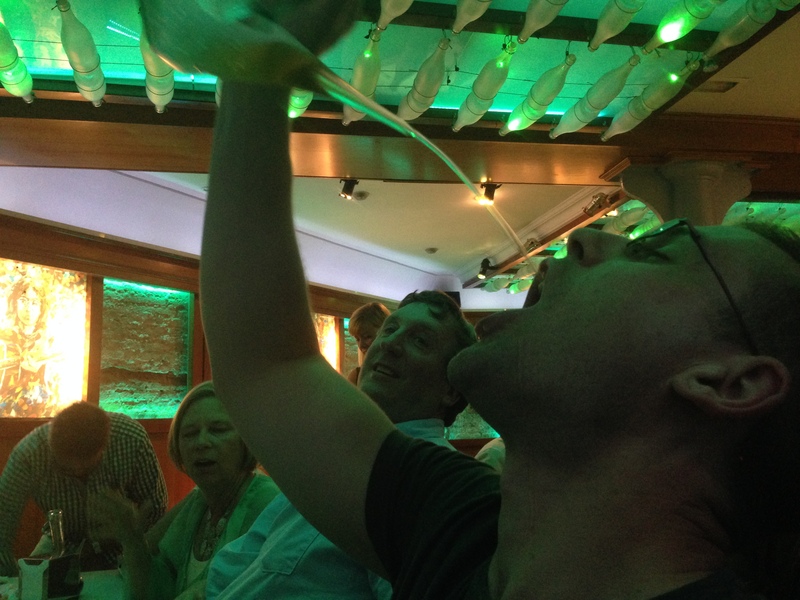 As you can imagine, by the third tapas bar, there was a bit of debauchery. And this is when they introduced us to the perron. Amongst potato pancakes and a couple more tapas they brought out the perron. There were three being passed around each table – one had red wine, one had white wine and the other had beer. It’s basically a wine decanter with a tube that you use to pour the wine into your mouth. Nick mastered it, of course, much to the delight of our South African friends who had consumed all of the red wine between them. Sadly, it came time for the night to come to an end. The tour guide (who was from Estonia) dropped us all off at another bar near the beach that gave us a free shot and also huge jugs of sparkling red sangria for seven euros each. Nick and our new friends ended up playing foosball for a couple of hours while the ladies sat back and chatted. It was an amazing night, far exceeding our expectations and so much cheaper than any other option could have been. There was a wide range of ages there and everyone had a great time. We went out expecting to spend about 40 euros on extras and ended up coming back to the hotel having spent less than 20 euro the whole night. We got back to the hotel at about one am and it seemed like Barcelona had just woken up. People were wandering the lanes everywhere, even little kids were still out! It felt like we were going to bed extremely early. The Gotic area feels like it should be unsafe – dark lanes everywhere, graffiti, dodgy people around – but it wasn’t at all. I think it is part of the charm. The next morning we woke up with pretty sore heads, but we didn’t have time to dwell on it. I had booked tickets to La Sagrada Familia and we had decided to walk there to help with the hangovers. We stopped at a bakery next to our hotel for breakfast – we got some pastry delights and empanadas. I bit into the empanada and realized it was pork. Cue awkward moment of deciding how to elegantly spit out food in public. Answer – there is no elegant way. The walk took about 30 minutes from our hotel but it was a nice morning and we got to see a lot of Barcelona. It also took us back past the Arc de Triomf. As it turns out – that park area IS an area for outdoor markets, and there was one on! We would be heading back later. La Sagrada Familia was an interesting church. It’s still under construction after over a hundred years and still has about fifty more to go before being complete. I’m glad I went, but if I was to go again then we would not go back on a Saturday morning. It was packed! We also did the tour the wrong way around, so we were wondering why things were being described that we couldn’t see – umm yes, we were looking at the wrong side of the building! Before our trip I had scoured tripadvisor in search of a good empanada restaurant. My first experience of an empanada was in New Jersey at a little convenience store near our hotel. I was hooked immediately! We walked from the church to a place called Las Empas. The empanadas appeared to be baked, not fried like I was used to, but they were delicious! I had a chicken one, a blue cheese and beef one and a vegetarian spinach one. We will absolutely go back next time we are in Barcelona. On the way to Las Empas, Nick spotted a churros hole in the wall shop. We ended up getting the most decadent thing I think I’ve ever eaten. It was a sugar covered churros with a hole the whole way through it, stuffed with dulche de leche. Can you imagine?! Food is absolutely one of the biggest motivations of our traveling, and this was one of those times where I couldn’t imagine my life again without that experience. It’s a little out of the way for walking, but the metro stop is close by so don’t miss this place. Just don’t. It’s life changing! We walked back to the Arc de Triomf for the market. I ended up buying a dress at it, which made the walk back completely worth it. The market was packed full of people but the food and stalls made it worth dealing with the crowds. On the food side there was a lane full of exotic and local foods. We ended up trying some tacos, which weren’t that good but worth a try. Nick got a pastry stuffed full of chocolate which again was ridiculously decadent. I don’t know how the Spanish aren’t obese, I guess they walk everywhere like we did. After the market, and a rest for our full bellies, we made our way to the tourist area called Les Ramblas. We walked up and down it a couple of times and went to the glorious closed food market – La Boqueria. It seemed like every food imaginable was available there. Nick was salivating at the fresh seafood and I was crying (just on the inside) at the dead octopus everywhere. Did you know that octopus have been observed in the wild playing with toys? And that they use tools? They’re so smart. Remember that next time you’re eating octopus. We ended up having dinner early at – you guessed it – the Hard Rock café. It’s become a tradition that I can’t break. Which Hard Rock is going to have the best mac and cheese in the world? So far the answer is Florence. It was a good meal but despite all the walking, our tummies were a bit full for the American sized portions. After dinner I dragged Nick through some clothes shops. I ended up buying quite a few clothes. It turns out that Barcelona is absolutely a shopping capital – leave room for purchases in your luggage! We ended up buying way more than expected. I would go back there just for the shopping. Again, things seemed to stay open late and the party was just starting by the time we were heading back to the hotel. I had read that like most other European cities, Barcelona shuts down on Sunday. We found breakfast at a small bakery again and left our bags with the concierge at the hotel so we could spend the last day exploring. We took the metro up to Park Guell. The closest metro to it was Vallcarca. From Vallcarca there were sign postings the whole way, so you won’t need data or a map to navigate to it. It was the only time we took the metro the whole weekend and it seemed very simple and easy to navigate. We would definitely rely on it more next time. There were outdoor escalators up to the park. That was amazing and unexpected. If they weren’t there though, I’m not sure we could have managed it. Ok, of course we could have but it would have been painful in sandals! Everyone had told me not to buy tickets to the actual Gaudi House and it’s closed off area. Everyone. All the forums I read said it and everyone I had talked to said it. In the end, and I think I’ve said it before – if you want to see something, make your own judgment on it and buy the tickets. We didn’t. Once we were there, they were sold out. I ended up not being able to see what I wanted to see and this resulted in a domestic between Nick and I because of my bad mood. Just buy the damn tickets. Now we have to go back to Barcelona (oh noooo… not. We’d be going back anyway). The view from the park of the Barcelona skyline was very cool. We hung around there for a bit, there were buskers and lots of locals running and walking through the park. There were public toilets and a café to eat at, so I would recommend heading up there. Just get tickets for the actual exhibition or risk getting annoyed at not being able to get into the restricted areas. If we had more time we would have been able to go as there were tickets available for the afternoon, but sadly we had a plane to catch. We then made our way back to the metro station. There were no escalators downhill, but it wasn’t so bad. 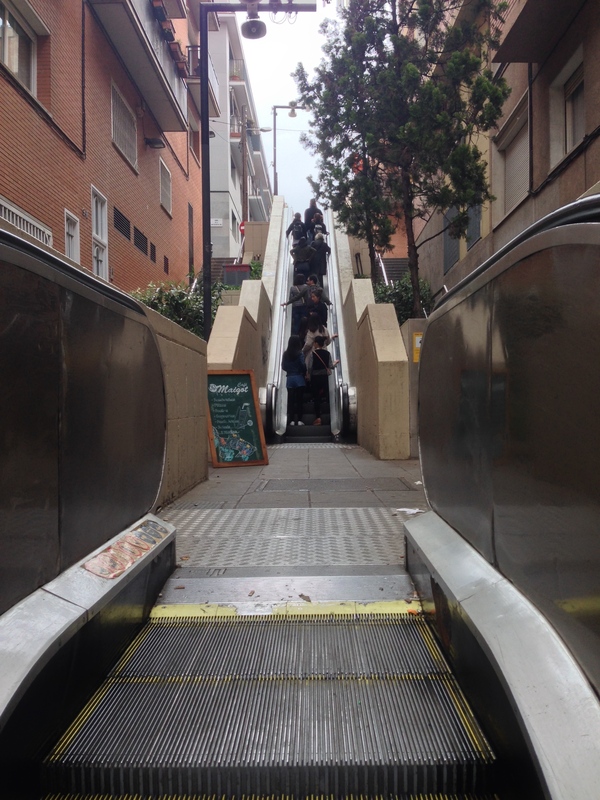 There were shops to stop in at along the way to break up the mundane task of going down hundreds of stairs. I ended up buying another dress on the way down at a random clothes shop. I’m telling you, this place is made for shopping and all at reasonable prices too! The rest of the afternoon was spent getting a quick lunch and then making our way back to Girona airport. We did stop back at the market at the Arc de Triomf on the way to the bus station and Nick got more of his delicious pastry filled with chocolate. We got back to Frankfurt Hahn at around 2100 to a wet and dreary Germany and our plane almost didn’t stop at the end of the runway. That was… exciting. I had bought a dorky money belt for around our neck to put our passports and money in. After the first day we realized it wasn’t necessary. There were a lot of unaware people wandering around that made themselves better targets than us. Despite its reputation, I didn’t think Barcelona seemed any worse for thieves than any other major European city. Just be aware! If you’re a woman, wear a handbag that is able to be fully zipped up and keep it close to your body at all times. Don’t make yourself a target. Men, don’t have your wallet in your back pocket. I would say this same advice for all major cities. Nick carried a wallet in his back pocket the whole weekend. There was nothing in it – we used it as a deterrent. Even while drunk at 0100 in the morning, while on the metro squeezed in, at the church in hoards of tourists, on Les Rambles – it wasn’t stolen. We were slightly disappointed but it just goes to show. This thing was obvious and it wasn’t even stolen. The metro is cheap if you get a T-10 ticket – not so cheap if you don’t. When we go next time, I’d have no problem staying further out as long as we were near a metro line. In all reality though, the Gotic area was perfect and worth the extra cost. Do the Sandemans tour if you aren’t travelling with kids or can find a babysitter. It was worth every penny, plus some! Get to the bus station early on your return. Ours was the last bus of the day and we ended up packing two buses full in a matter of minutes. The people left over had to wait for another one – so stake your claim in the line! We saw a lot in three days – and those three days were packed full. If we had another day, I think we would feel as though we had seen most of Barcelona. I would recommend four days for Barcelona – but of course, more time would be even better! Well, vacation season is upon us now and there will be a lot more being added to the blog this summer. Vienna, Austria – New Years!